This post is an unexpected collaboration, one which I nevertheless believe thoughtful. Lately I’ve been feeling a little out of my element, such as every other human being once in a while. But there are the everyday things that remind me to love not just myself, but all the things and people around me. These nuances of everyday life are worthy encapsulations of hope and happiness. A few words before I get on with my favourite recipe for delicious vegan crepes. I usually review cafés and restaurants, but I thought I’d make an exception just this once. Today I kinda want to talk about flowers. OK, hear me out. My mum also recently got a huge bouquet of flowers, which she describes as a make-or-break element of any room. There’s something incredibly emotive and symbolic about a single bouquet. This is the sort of underrated everyday life thing I was talking about earlier. I’ve been on both sides of the flower-giving tradition—the recipient and the presenter—so I’ve been acquainted with a fair share of florists and flower delivery in Singapore. One particular flower delivery in Singapore which stands out from all the other florists is A Better Florist. Unlike what you would expect from usual flower shops, they do have a better sense of their target market’s taste, and yes, I am part of their target market. I imagine they conceptualised their rustic yet stylishly-packaged flower arrangements with young and social media-savvy customers in mind because these bouquets are quite the eye-catchers. Although this post is in collaboration with them, I am a genuine fan. If you follow me, you’ll know that my posts are mostly centred on food. However, I do appreciate the fresh fragrance of lush blooms mingling with the aroma of a cup of strong black coffee and French toast in the morning. That, to me, is the best way to start any day. A Better Florist, also known as the best florist in Singapore, is relatively young when compared to other flower industry players in Singapore, but their determination to “Bloom Better” with great quality flowers and lightning-fast delivery has caught the attention of flower aficionados in my little red dot. They’ve gotten quite a lot of media attention and have been dubbed best florist in Singapore and best flower delivery in Singapore on several review sites. I’ve only really purchased their hand bouquets and so far they have not disappointed at all. The flowers were fresh, delivered on time, and I adored the detail of their packaging—from the burlap wrap to the carefully tied ribbon and the flower care instructions. Once, I ordered from their signature blooms collection and it came with this lovely twine-wrapped container which I used to display the flowers. Props all around for their excellent service. If you’re looking for something other than flowers, they do have gift baskets and hampers as well as fruit baskets. I might avail their fruit basket delivery for my pantry just to see the quality of their produce. I’ll let you know how it goes. Meanwhile, they also sell flowers for all events and occasions like grand opening flowers, wreaths, baby gift baskets and “get well soon” bouquets. The holidays are rolling around pretty soon, so just in case you’re planning on hosting dinner parties, A Better Florist 100% has my vote for the freshest, fastest and cheapest flower delivery in Singapore. Just a little fun. And, like everything else I make, so easy. My favourite part is seeing the little holes pop out in clusters (slightly aggravating the little trypophobic me but hey), mini astroblemes produced by the impact of some cosmic body. I love mushing these into spoonfuls of thick, creamy soy yoghurt and frozen berries. Darn, I might have one soon because there are a few left over waiting in the fridge. Preheat your large pan (use a crepe pan if you’re fancy and feelin’ it) on medium-high heat and drizzle on some olive or coconut oil. In a large bowl, whisk together the dry ingredients, then add the espresso, oil, and finally the milk. You can do this the night before to save yourself some 30 seconds in the morning, if you wish. Simply whisk it all together and cover with cling film before putting it in the fridge. When you can see the oil sizzle a little, add 3-4 tbsp of batter and swirl around to coat the bottom of the pan thinly. Watch the batter go a little darker and firm around the edges. Once you see a few bubbles, which will take a minute, use a spatula to flip the crepe and cook the other side for another minute. Rest your cooked crepe on a paper towel to absorb excess moisture. Continue to cook up the rest of the batter, stacking the crepes with paper towels in between. Enjoy these with thick plant-based yoghurt, fresh or frozen berries, a drizzle of nut butter or tahini, and lashings of maple syrup. Sundays can be more magical than you ever think them to be. A quickie, because I want you to make it now, or at least soon, before the magic of what you see above dissipates. 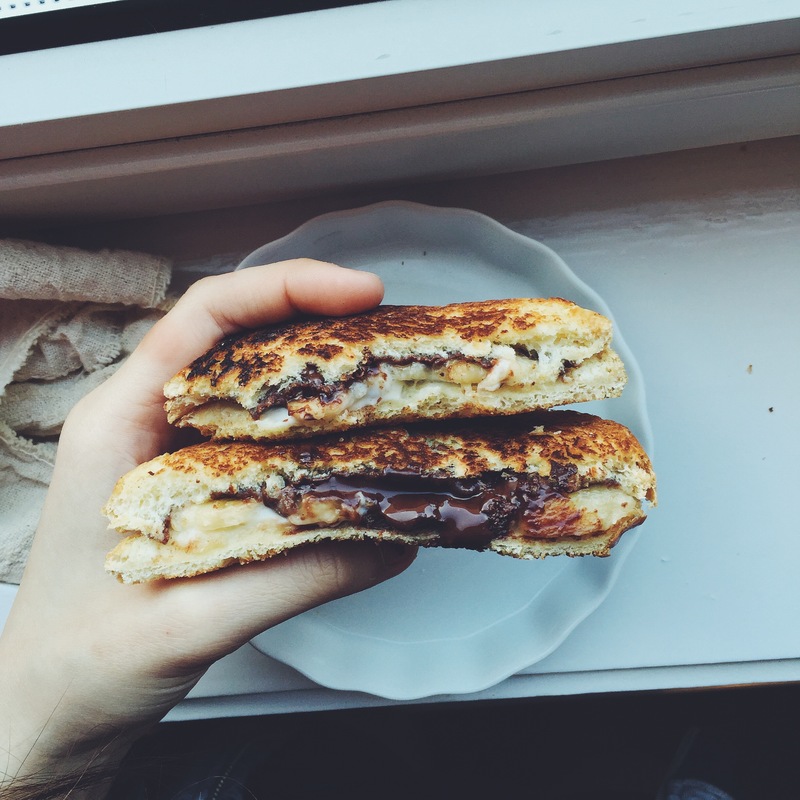 Chocolate and banana is a sworn classic, at least to me anyways, and this sandwich has all the goods and more. I wouldn’t call it ‘chocolate and cheese’, because that juxtaposition looks and sounds sacrilegious, because I might as well say ‘chocolate and cheddar’ and make you all gag. Saturday night made me too pink from the drink. With a late start on Sunday, something easy but lush was much needed. Thrown together in haste, but well astonished afterward. I must thank the gooey, perfect, sinful result of melting chocolate, mascarpone and gooey ripe banana mashed between commercial brioche. Heat a pan on medium high heat and ready a generous knob of butter. 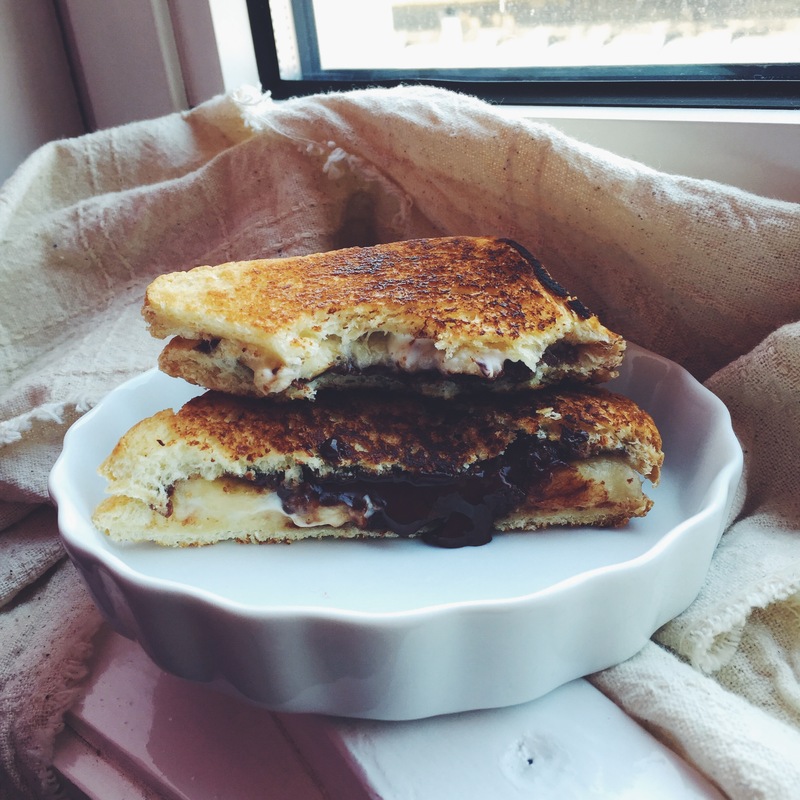 On one slice of brioche, spread a thick layer of chocolate spread (nutella/chocolate peanut butter/chocolate spread) and layer on slices of banana. On the other slice, spread a thick layer of mascarpone, and then layer on either one big square of dark chocolate or many small chunks of chocolate. Sandwich the slices together. Place butter in preheated pan, spread around a little, then place one side of the sandwich on the hot pan. Leave for 2 minutes, then flip to cook the other side. The surface should be a golden-brown. Slice on the diagonal (it’s a rule), admire the oozing chocolate and then bite right into the middle while still hot and moist.